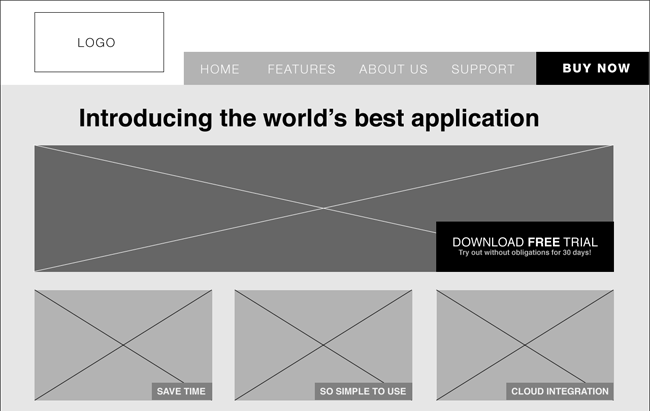 Wireframing Your Website: What is it And Why Should You Use It? There was a time when a website’s design wasn’t given much importance to because there weren’t many features, but today the tides have changed. Websites play a vital role in helping businesses make a presence on the World Wide Web. A lot of businesses and brands are focusing on their websites because it serves as a trademark and helps them reach a broader audience. There’s one crucial element that helps make a website better, wireframing. Wireframing is the phase where the designer and the client come together to discuss the arrangement of content and work together to boost user experience. In other words, wireframing can be referred to as a rough website structure planning which determines the page elements to include, placement of contents and visuals, website features, conversion areas, etc. It’s like preparing a blueprint before making a building. Wireframing excludes the artistic elements such as fonts, colors, etc., because its sole purpose is to strengthen the foundation of the website. A website shouldn’t be restricted to good looks only; there’s more to it. What’s more important is how easily can a user access the features, navigate the website and find the data that he or she needs. This is exactly what wireframing is all about. When a designer is wireframing, the entire focus is on the user side. The designer along with the client determines how information should be portrayed on the website so that it is easy for users to search and use content on the website. It is essential to know which features will do good on a specific website and which won’t. Wireframing can help in this regard. When a designer begins to wireframe a project, he/she uses various tools and apps to determine which feature is needed and which isn’t. For example, search feature may be important for some sites, but not all. Including it where it isn’t needed would just cause clutter and may even affect the look of the website. Wireframing allows you to test what goes well with a website and what doesn’t. Designers who are at the initial stage of their career often think of wireframing as a time-consuming process, but it’s the other way around. It helps you save time. A properly wireframed project is calculated and easy to comprehend. It makes it easy for the designer to construct a good design from the blueprint and the risk of making errors is also reduced. This saves a lot of time in the long-run. Most professionals use wireframing as they are aware of its benefits. Wireframing is an important tool and is preferred by many local web designers. It not only helps you design a highly interactive website but also makes its foundation strong.